Whether you are new to the area, a new parent, a child care provider, or a business or individual interested in the impact early education/child care has on our community, CCRC is your trusted source for information about quality child care in Forsyth and the surrounding counties. Child Care Resource Center (CCRC) is a private, 501(c) 3 non-profit child care resource and referral agency committed to providing consumer education, child care referrals, resources, and professional development opportunities to support quality child care. 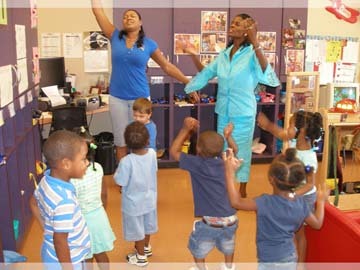 Our mission involves Enriching Childcare, Engaging Families, and Enhancing Communities. The work of CCRC focuses on matching child care services with child care needs, providing professional development opportunities to early childhood professionals, and providing public awareness about the importance of quality child care. We believe quality child care experiences set the groundwork for future learning. Our qualified staff connects parents, businesses, and the community at-large with trained child care professionals and services. Home of the largest database of child care programs in the region, CCRC offers a combination of free and fee-based services to suit the needs of all families. CCRC provides services in English and Spanish for parents, early childhood professionals, employers and the community in general, utilizing funding from government and private sources. In 1991, a joint effort between the Junior League of Winston Salem, Northwest Child Development Council, The Winston Salem Foundation and United Way of Forsyth County provided research and funding to support the development of Child Care Resource Center as a vehicle to provide child care resource and referral services to the community. Our mission involves Enriching Child Care, Engaging Families, and Enhancing Communities. The work of CCRC focuses on matching child care services with child care needs, providing professional development opportunities to early childhood professionals, and providing public awareness about the importance of quality child care.